The expansion tank was empty so I filled it and before the car was warm I opened the radiator cap and filled it until it was full. I watched the coolant flow through as it was running. Then I capped it and I drove it about thirty miles and parked it for the night. Next morning I noticed a leak on the ground near the water pump and AC compressor. I tried to look for a source but I was unable to find one. As I was in there I figured I would look around and then I found another coolant leak under the distributor cap. I decided to buy a new radiator cap since it was old and might not of been releasing pressure causing the leaks. I replaced it and the leaks were still happening so now I am here. If the lean is near the pump, either there is a leaking hose or the weep hole on the pump is leaking. Take a look through this link. 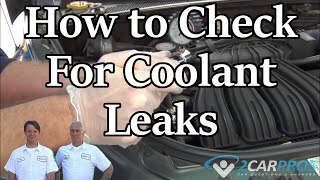 It discusses how to check and repair coolant leaks. It does discuss the weep hole I mentioned. Here is a link that shows how to pressure test the cooling system. You will need to rent the tool, unless you have one. As far as the distributor cap, there is no coolant in it. If there is coolant there, check heater hoses around it. If you find the leak is the water pump, here are the directions for replacement. The first two pictures correlate with these directions. 1. Remove timing belt, refer to TIMING BELT. 2. Remove water inlet and bypass pipes. 3. Remove water pump mounting bolts, then water pump, Figs. 109 and 110. 4. Reverse procedure to install. 1. Turn the crankshaft and align the marks. Mark the timing belt rotation for proper reinstallation. 1. Install the tensioner and the tensioner spring. 2. Temporarily secure the tensioner with the spring fully extended. 1. Verify that the timing belt pulley mark is aligned with the timing mark. 2. Verify that the camshaft pulley marks are aligned with the cylinder head cover mark. 3. Install the timing belt so that there is no looseness at the tension side. Do not turn the crankshaft counterclockwise. 4. Turn the crankshaft two turns clockwise, and align the timing belt pulley mark with the timing mark. 5. Verify that the camshaft pulley marks are aligned with the cylinder head cover mark.If not aligned, remove the timing belt and repeat from tensioner installation. 6. Loosen the tensioner lock bolt to apply tension to the timing belt. Be sure not to apply tension other than that of the tensioner spring. 7. Tighten the tensioner lock bolt. 8. Turn the crankshaft 2 turns clockwise and verify that the marks are correctly aligned. 9. Check the timing belt deflection by applying moderate pressure (98 N, 10 kg, 22 lb) midway between the crankshaft pulley and the camshaft pulley.If the timing belt deflection is not correct, temporarily secure tensioner lock bolt so the spring is fully extended and repeat steps 4-8 above or replace the tensioner spring. 1. Apply antisize compound or molybdenum-based lubricant to the spark plug threads. 2. Install the spark plugs. Make sure the timing belt inner guide plate is installed in the proper direction. 1. Install the timing belt inner guide plate. 1. Connect the negative battery cable. 2. Start the engine and check the ignition timing. 1. Disassemble in the order shown in the figure, referring to Disassembly Note. 2. Assemble in the reverse order of disassembly, referring to Assembly Note. 1. Hold the flywheel (MTX) or drive plate (ATX) by using the SST. 2. Remove the crankshaft pulley and plate. 1. Turn the crankshaft clockwise and align the timing marks of the pulleys. For the crankshaft side, face the locating pin on the pulley boss straight up. 2. Hold the flywheel (MTX) or drive plate (ATX) by using the SST. 3. Remove the pulley boss. The following will damage the belt and shorten its life; Forcefully twisting it, turning it inside out, or allowing oil or grease on it. 1. Mark the timing belt rotation on the belt for proper reinstallation. 2. Loosen the tensioner lock bolt. 3. Push the tensioner in the direction of the arrow and hand tighten the lock bolt. 4. Remove the timing belt. Insert the key into the timing belt pulley, facing the tapered side downward. Push the key until it stops. 1. Install the tensioner spring as shown. 2. Push the tensioner in the direction of the arrow and hand tighten the lock bolt. 1. Verify that all timing marks are correctly aligned. 2. Install the timing belt on the pulleys in the order shown below. 1. Install the pulley boss and pulley lock bolt. Turn the crankshaft clockwise 1 and 5/6 times, and verify that the timing mark and the tension set mark (A) are aligned. 2. Loosen the tensioner lock bolt to apply tension to the timing belt. Do not apply tension other than that of the tensioner spring. 3. Tighten the tensioner lock bolt. 4. Turn the crankshaft clockwise 2 and 1/6 times, and verify that all timing marks are correctly aligned. 5. Check the belt deflection at the point indicated by applying moderate pressure 98 N (10 kgf, 22 lbf). 6. If the timing belt deflection is not correct, remove the timing belt and repeat from timing belt assembly note step 1. 7. Hold the drive plate (ATX) or flywheel (MTX) by using the SST. 8. Tighten the pulley lock bolt. 1. Hold the drive plate (ATX) or flywheel (MTX) by using the SST. 2. Install the crankshaft pulley and plate. 1. Remove all foreign material from the cylinder head cover groove. 2. Apply silicone sealant to the cylinder head cover as shown. 3. Install the new cylinder head cover gasket into the cylinder head cover. 4. Apply silicone sealant to the shaded areas as shown. 5. Install the cylinder head cover. 6. Tighten the cylinder head cover bolts in five or six steps in the order shown. Please feel free to let me know if you have other questions or need help. Also, let me know what you find.